Generate Code 128 Barcodes for integrating into other apps with IDAutomation's Code 128 Font Encoder Software Application. The encoder app auto-detects the installed IDAutomation barcode fonts to apply to encoded data string output. Download Code 128 Font Encoder Software App by IDAutomation.com, Inc.
PCWin Note: Code 128 Font Encoder Software App 2016 download version indexed from servers all over the world. There are inherent dangers in the use of any software available for download on the Internet. PCWin free download center makes no representations as to the content of Code 128 Font Encoder Software App version/build 2016 is accurate, complete, virus free or do not infringe the rights of any third party. PCWin has not developed this software Code 128 Font Encoder Software App and in no way responsible for the use of the software and any damage done to your systems. You are solely responsible for adequate protection and backup of the data and equipment used in connection with using software Code 128 Font Encoder Software App. Barillo Barcode Software - Free Barcode Generation Software. Easily create UPC and EAN barcode graphics within seconds after downloading Barillo Barcode Software. Preview barcodes before exporting to a variety of graphic formats at whatever size you need. Taboga Barcode Library - Barcode Library enables you to insert barcode "controls" into your windows and reports. Hash4Cash Spam Guard - Painlessly simple way to protect your email address through Hash4Cash Spam Guard Software through our step by step wizard you will get a very nice code to protect your e-mail address. Sequentum SQL Sharp - SQL Sharp is a Visual studio addin that allows a software developer to write SQL statements straight into his source code. Tempteller - Tempteller is a free software that speaks temperature and displays other information about the weather for a zip code you enter. Motion Control API - PMC's Motion Control Application Programming Interface (MCAPI) is a suite of programming libraries, drivers, help files, sample programs (with source code), and utilities for C/C /C#, Pascal, LabVIEW and Visual Basic programmers. 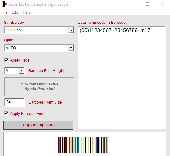 Bytescout BarCode Reader - Freeware Bytescout BarCode Reader can read barcode from image (JPG, TIFF, PNG, GIF), can read barcode from PDF. The software is based on Bytescout BarCode Reader SDK for software developers. Reads Code 39, Code 128, QR Code, PDF 417.. and much more! IDAutomation.com Code 128 Font Adv Package - Code 128 Barcode Fonts, also known as GS1-128, UCC-128, EAN-128 and others, can be used on any operating system such as Windows, Linux, Unix and Macintosh that supports TrueType, OpenType, PostScript and PCL fonts. Barcode macros for OpenOffice and StarOffice - Add barcodes to OpenOffice and StarOffice with our Visual Basic macros and free barcode font. Technoriver Free Barcode SDK - Technoriver Free Barcode SDK is a .Net Windows Form Control that allows you to easily add professional quality bar codes to Windows applications developed in Visual Basic.Net, Visual C#.Net and any development environment in the .Net Framework. dbForge Index Manager for SQL Server - SSMS add-in for analyzing the status of SQL indexes and fixing issues with index fragmentation. The tool allows you to quickly collect index fragmentation statistics and detect databases that require maintenance. More Software of "IDAutomation.com, Inc."
IDAutomation Barcode Label Software - This is a high quality, easy to use barcode WYSIWYG label design and printing software application. Bar code values can be incremented, retrieved from a database or CSV file or determined by VB script. IDAutomation Data Matrix Font and Encoder - Our DataMatrix bar code fonts allow printing of high density ECC-200 Data Matrix symbols with TrueType, PCL and PostScript fonts. Includes VB code, Java Library, DLLs and examples for Excel, Word, Access, Java, .NET and Crystal Reports. IDAutomation PDF417 Font and Encoder - This professional grade package enables printing of high density PDF417 barcode symbols with TrueType, PCL and PostScript fonts. Includes Applet, Servlet, Java Library, DLLs and examples for Excel, Word, Access, Java, .NET and Crystal Reports. IDAutomation Java Barcode Package - This barcode package contains JavaBeans, Applets, Class Libraries and Servlets for Barcoding in Java. Supports Linear and 2D barcode types including Code 128, Code 39, ITF, UPC, EAN, OneCode, DataMatrix, Maxicode and PDF417. ActiveX PDF417 Control - The ActiveX Barcode PDF417 Control is an easy to use drag and drop barcode tool. It works with any Windows application that supports ActiveX technology including Visual Basic, C++, FrontPage, Internet Explorer, Microsoft Word, Excel and Access. IDAutomation Barcode .NET Forms Control DLL - This professional barcode package includes the Linear .NET Forms Control and DLL for creating bar codes in Visual Studio and the .NET Framework; includes examples for C# and VB.NET. Supports all popular linear barcodes and RFID. Barcode Generator for Microsoft Access - Create barcodes in Microsoft Access without installing additional fonts or other components with the IDAutomation Native Generator.